Congratulations, sohamolina, katklaw777 and Penny W! Thanks to everyone who entered the Meet the Double Duty Divas giveaway as well! As the winner is being drawn from the compiled entries from all of the participating blogs, I will update this post with the winner's information when it has been announced. 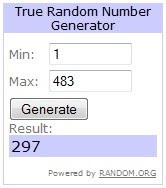 Update: I've been told that the winner is entry #20 over on "Deal"icious Mom. Congratulations, Laura! I hope everyone has a wonderful holiday weekend! Just want to say thanks again! Hi new friend, I am now following you via MBC. Congrats to all of your winners!